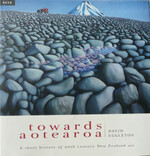 A short history of 20th century New Zealand art by award-winning author David Eggleton. (Montana Book Awards). This 280page first edition book ,in perfect condition with dust cover, is highly readable and an entertaining introduction to New Zealand art. It makes a perfect gift with over 50 colour plates and accompanying text giving an insight into some of New Zealand's most interesting artists.